I have been abstaining from blogging for over 2 weeks. 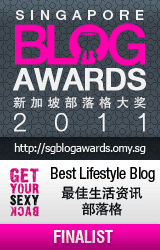 Why it takes me so long to blog again even though I've come back to Singapore for a week by now? 1. My cellphone's camera is spoiled when I was in Malang. Although I have a new SONY camera now, but I usually used my cellphone's camera for random photo takings which usually become the materials of my blog and only use my real camera when I visit places and intend to take a lot of good photos. I find cellphone cameras are just convenient as I can take photos immediately each time I want to without having to put extra weight in my bag (real camera) and transfer the photos via blue tooth each time I feel like blogging. Basically I just love the cellphone/camera function in one gadget. Simple and light. All in all, I suddenly had no mood to record things (in pictures and writing) for days because of this accident. Lesson to learn: Not to buy Sony Ericsson phones in the future and return to Nokia. I can't believe, after one drop the cellphone is spoiled. 2. When I came back to Singapore last week, I was greeted by my dead plants. Three of five plants that I nurtured wilted and one became really dried like a burned plant. I have actually trusted my housemates to water my plants when I was away. I told them not to water them everyday as I know that taking care of plants to those who have no interest in planting/gardening can be such a burden and taxing. Water them once every two or three days would be just fine, I said. Please take care of them for me. Turned out, they did not water them at all for 10 days, I suppose. I was pretty sad and shocked as I really took care of them very well. I have grown them from seed to flower and watered them every morning. Then when I came back home, first thing I saw before I opened my apartment's front door was collapsed and dried out plants. Lesson to learn: Maybe it's best to ask for your neighbors who have plants too to take care of yours when you can't take care of them instead of trusting them to somewhat irresponsible people who live under the same roof as you. Sorry for the harsh words, even though I had no hard feelings to them anymore by now, it was plain disappointing when I found out that all my green babies wilted and dried out and (0ne) died. 3. I was busy editing Baby Obama's photos. My new adorable toy in Malang whom I miss dearly. I wonder if looking at her photos would make me miss her less (as her grandma said to me). Instead, I feel like seeing, holding and playing with her again and again each time I revisit her photos I took back home. 4. I was tired every night after I came home from work. Lots of things to catch up and mess to clean. New project has shared its distinctive headache too on my side. Again, I had no mood to think or write after work. But, now I am back. I hope I can keep my blogging spirit and mood as per normal, before all these unexpected calamities hit me.